there are few things that make my taste buds happier than fresh peaches in summertime. peaches are my absolute favorite fruit + i look forward to their arrival every year. juicy, scrumptious peaches are in full force at our farmer’s market recently, + while i’ve devoured most of them while standing over my sink, juice dripping everywhere, i’ve also tried to use them in new, fun recipes. when i saw this recipe for fresh peach lemonade a couple weeks ago, i knew i had to try it. and sweet fancy moses, i’m so glad i did. this lemonade is absolutely wonderful + it makes for a crisp, refreshing warm weather drink. while it’s perfect just the way it is, i think it would be fantastic made into fruit tea by mixing it with brewed black ice tea. 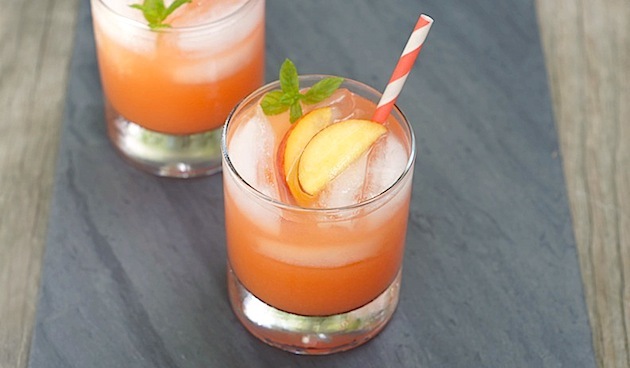 or, it would make an amazing summer cocktail if you added some white rum, vodka, or bourbon! regardless of which way you drink it, i know that you’ll love it! and if you’re looking for some more uses for those awesome, fresh peaches, check out these peach + amaretto popsicles or this fresh peach + raspberry galette. both are incredible! combine the first 3 ingredients in a medium saucepan over medium-high heat. bring to a boil; reduce heat, + simmer for 3 minutes. place peach mixture in a blender; let stand for 20 minutes. remove center piece of blender lid (to allow steam to escape); secure blender lid on blender. place a clean towel over opening in blender lid. blend until smooth. pour into a large bowl. refrigerate for at least 3 hours. press peach mixture through a sieve over a bowl, reserving liquid + discarding solids. stir in lemon juice. place 1/2 cup ice in each of 8 glasses. 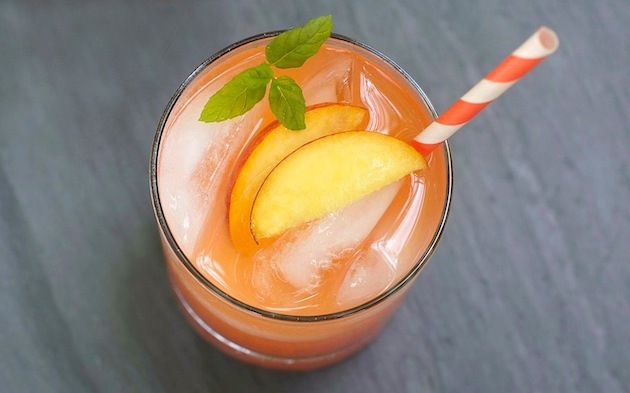 pour about 2/3 cup lemonade into each glass; garnish each glass with a peach wedge. Ooh, pretty! I actually have lavender lemonade in the fridge at home! I really like that you used fresh peaches for this one!! What a refreshing drink! If this doesn’t scream ultra-refreshing amazingness I don’t know what does. o.O I am so in heart with this right now! It’s beautimus! I made this today with some honey instead of the sugar. Yummy! It was way easier than it sounded. I just let it cool and then put it through the food processor and didn’t drain it because I like the pulp. Thanks for the recipe! Perfect for summer. Yay, I’m thrilled that you made it + liked it! I like your substitutions of using honey + keeping the pulp – those would both definitely make this even healthier + more ‘whole.’ nicely done, friend!